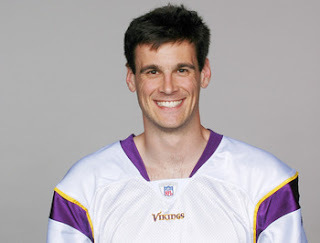 Welcome to the first ever interview here at the Pulling Linemen, and we'd like to introduce Minnesota Vikings punter Chris Kluwe! Kluwe is a 7 year NFL vet who signed with the Vikings after a brief stay in Seattle in 2005, having gone undrafted out of UCLA. 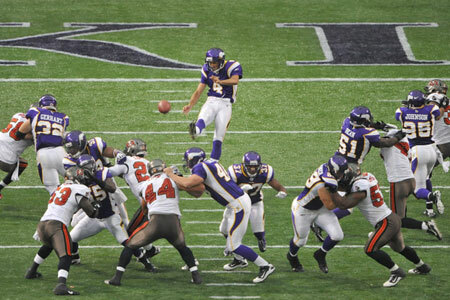 Since then, he has played in 111 regular season games and recorded close to 25,000 punt yards, having only 1 blocked. Chris is also a very outspoken member of the player community, and a very funny one at that, who also plays bass in Minneapolis-based Alt-rock band Tripping Icarus. The Pulling Linemen: Thanks again for talking to us, Chris. The last 12 months in the NFL has been full of controversial stories, from the CBA negotiations, to bountygate, and recently with the sad death of Junior Seau. You’re known around the league as being very happy to speak your mind on the big issues, so with much going on we want to get straight in to the serious stuff with you. Did Donovan McNabb ever buy you that ice cream? 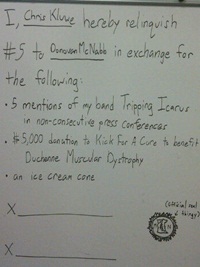 Chris Kluwe: I never got the ice cream cone from Donovan, but I think I'll be able to survive. It would probably just make me fat anyways. TPL: As part of your deal with Donovan for the #5 jersey, you also asked him to mention your band, Tripping Icarus, in 5 postgame press conferences. You guys are back in the studio to record your second album, are you excited to get recording? Is a career in music something you can see extending beyond your time in the NFL? CK: We're very excited about this next album, as we feel we're getting better and better with each one we record and there's a lot of powerful songs on this one. I would love to have a career in music after I'm done playing football, so we'll see if that works out. TPL: The subject of post-football life has been in the forefront of people’s minds in recent days with the passing of Junior Seau, with concussions cited as one of the possible causes of his psychological issues. Jacob Bell, former Rams and Titans offensive lineman, announced his retirement worried about this issue - is it something that would make you reconsider your place in the NFL? CK: Well, as a punter I don't really take the shots to the head that other guys do, but if I did I think that's something you have to very seriously consider. You only get one brain and it's pretty hard to fix if something goes wrong, so ultimately it comes down to is the risk worth the reward. For some guys it is, for others it isn't. TPL: During your career you have seen players come and go in the league, is the concussion issue something players talk or worry about, and is there any concern that perhaps players being unable to adjust to life after football might be an even greater risk to former players wellbeing? CK: I haven't heard anyone talk about concussions very seriously before this, but I think that's because no one knew the long term effects and just how devastating they can be. Now that there's solid medical evidence that concussions can cause serious long term problems, I think we're starting to see those protections being put into place for guys to have a certain quality of life after they're done playing. TPL: You were very openly critical of the players and coaches involved in the Bountygate scandal, particularly following the release of the Gregg Williams audio where he called for players to target weak ACLs and go for headshots on players recovering from concussions. Did the bounty system in New Orleans cost you a Superbowl ring? CK: No, five turnovers and 12 men in the huddle cost us a Super Bowl ring. We had plenty of chances to win that game and just couldn't get it done; while bounties are reprehensible and I think they were definitely going after Brett, it was still on us to win the game. TPL: You called for Williams and Vilma to be banned for life, do you think they’ve been let off easy with Vilma getting a 1 year suspension, and Williams suspended indefinitely? CK: I think the punishment fits, since if Vilma's out for a year there's a very slim chance he'll come back and play (seeing as he's approaching the end of his career anyways) and Williams is going to find it very hard to get a meaningful coaching job; most teams won't want the negative attention that will come their way from hiring him. That being said, it also leaves open the chance for rehabilitation and redemption for each guy which I think is a good call by the commissioner. TPL: What do you think about the recent news that Vilma is going to sue Commissioner Goodell for defamation after his suspension was handed down? CK: I think it's a poor decision if the evidence is actually there that Vilma even talked about paying money to cart someone off. If he's innocent that's fine, he has his rights, but I find it hard to believe the NFL would take that drastic a measure without some pretty solid proof, and if that's the case Vilma should just take his punishment like a man. TPL: Would you ever be able to be a part of a locker room that contained Vilma, Williams, or even those given smaller punishments by the commissioner, like Sean Payton, Will Smith, or Anthony Hargrove? CK: Sadly, I still haven't convinced Zygi to consult with me on every personnel move, so I think that one might be out of my control :) I would prefer not to be if I had the choice. TPL: Some players not involved with Bountygate have suggested that this issue goes further than has been publicised, with players being told they would face financial penalties if they didn’t target players injury weaknesses. Do you think this story has a sting in its tail that hasn’t come yet? CK: I find that hard to believe, I think the peer pressure and general pressure to make the team would be enough to sway most guys. Unfortunately it appears that the moral fiber to take a stand for what's ethically right and refuse to participate in the program wasn't quite there. TPL: You arrived in Minnesota as an UDFA, having been cut by the Seahawks at the end of their 2005 camp. How did you find the whole experience of going undrafted, signing with Seattle, and then losing your job again? 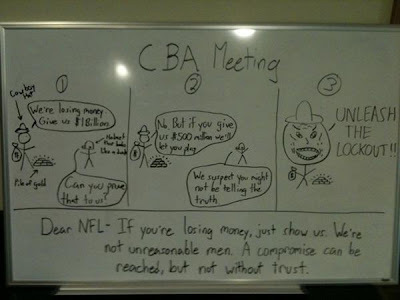 Was there ever a time you felt that the NFL wouldn’t be for you? TPL: Team facilities are full of new rookies at this time of year, but high picks in particular are now restricted in the amount of money they can make under the new CBAs rookie wage scale. As a seasoned veteran, this must be something you support? CK: I think it helps a lot in bringing down a lot of the overpriced rookie deals for guys who never played a down in the NFL and freeing up that money for veterans who've shown they can play. I also think it actually helps the rookies get acclimated faster, since now you don't have any incentive to hold out of OTA's and training camp due to the contracts being pretty much structured already. TPL: During the CBA negotiations, you were very vocal about certain high profile players dragging their feet on getting a deal done, do you think the CBA has been unfairly negotiated to favour certain players or positions? I ask particularly particularly because punters have not been allowed to punt at their own teams facilities during the first phases of off-season workouts. CK: Hehe, nah, it's not just punters who get screwed there, pretty much everyone who's not a quarterback doesn't get to touch the ball during those first two weeks :) I think the CBA was generally fair to both sides since both were unhappy with how it turned out. TPL: In 2007 you signed a multimillion dollar deal through 2013, which put you in the top 10 paid punters in the league. With the deal due to expire next year, do you want to stay in Minnesota (now it looks as though the franchise will)? As a California guy and a UCLA grad, would you rather be playing in LA? TPL: With teams doing everything in their power to renew their stadium deals in their current markets, do you think that LA needs the NFL more than the NFL needs LA? CK: I think that LA is kind of a stalking horse the NFL can pull out if cities are recalcitrant to work a new stadium deal, but it's a legitimate threat because it is one of the largest markets in the U.S. One thing I will say though, having grown up in Southern California, is that if they ever do move a team there, that team will have to be a playoff contender within the first two years or people just won't go to the games. There's so many sports options in the area that if your team doesn't perform, people will find someone else to cheer for. TPL: To finish, we’ve got a couple of questions for UK fans. With the NFL International Series continuing to put regular season games in London, Canada, and potentially elsewhere in the near future, how do you feel about the prospect of playing outside the US? Would you like the chance to play in London? 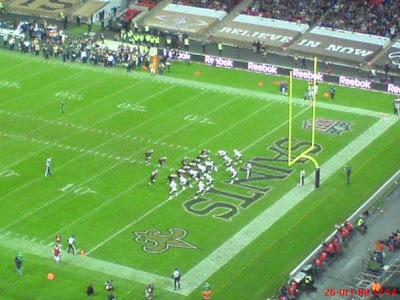 My view of Chargers-Saints at Wembley in '08 - Will the Vikings ever visit? 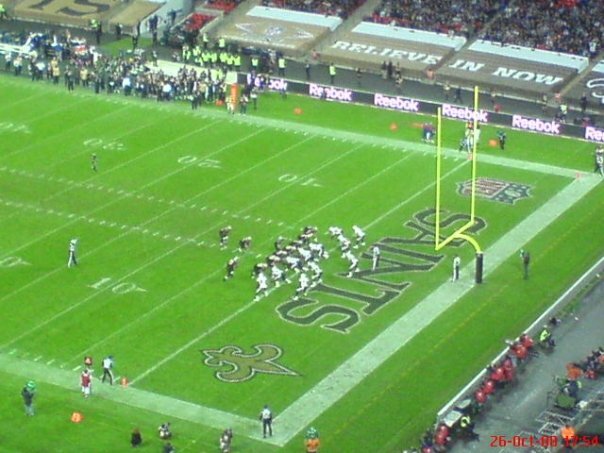 TPL: The Rams committing to playing 3 games in London over the next 3 years has raised the possibility of a permanent NFL franchise here in England. Do you think that could ever happen, and would you be willing to sign for them if the opportunity came up? Would living outside the US and the increased travel demands put you (and maybe other pros) off? CK: I think there's a definite possibility that the NFL could expand to both England, Canada, and even Mexico; the main issue then is travel. You'd probably have to realign the conferences to an Eastern and Western conference to keep the jet lag manageable; long flights do affect your on field performance and that logistical problem is the greatest challenge they'll have to overcome. As far as playing there, I'll play for anyone that wants to give me a paycheck, as would every other player in the league I imagine. You can follow Chris on twitter at @ChrisWarcraft and we strongly recommend you do. A lot of smart and funny things come from it! 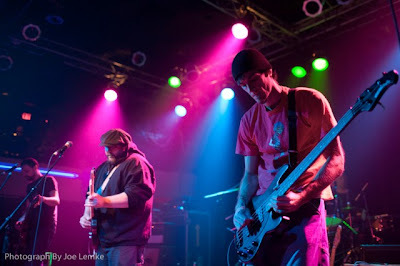 You should also follow @TrippingIcarus and visit their website www.reverbnation.com/trippingicarus for news on how their new album is coming along. Plus, don’t forget to follow us @PullingLinemen and look out for our next "TPL Interviews..." coming very soon!